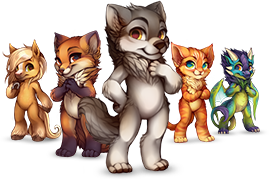 Most of the game play on FurVilla originates from the villagers. Whether you're breeding animals, making Painties, or crafting costumes, the villagers form the foundation. 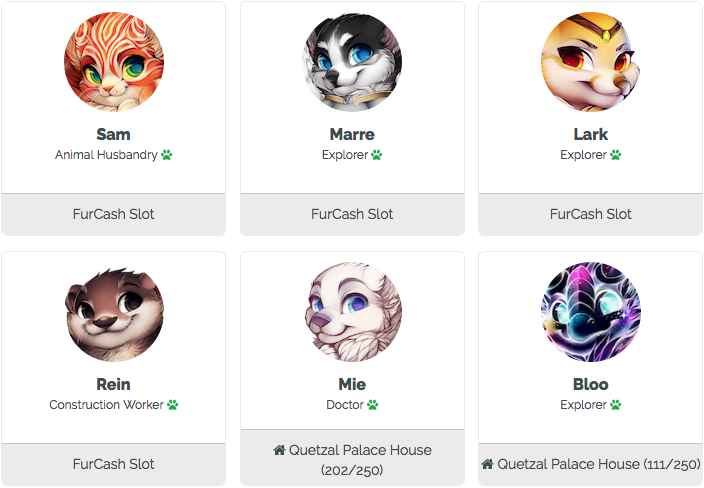 Excluding FurDollars which require purchase by real life currency, the Villagers' actions also generate all of the currency in the form of FurCash from their Careers. When creating a new Villager, you only have access to 3 of a species' colors. You need to use a Morphing Potion made by Alchemists to choose from all of the available colors. Limited holiday colors are not among the choices for a Morphing Potion. Those can only be obtained from the appropriate Magic Plush from the event. 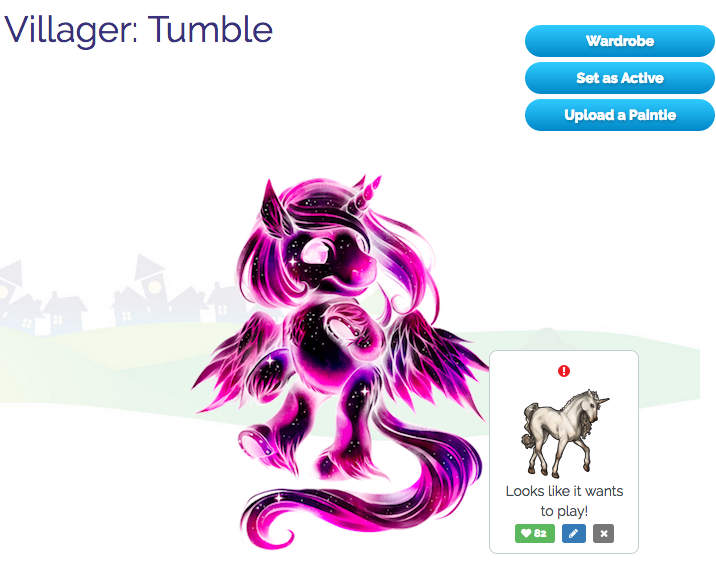 There are two main ways to manage your Villagers: the Villagers page and your sidebar. By default, Villagers are displayed in the order of when they were placed into a house. You can sort the order of the villagers in their houses by clicking and dragging. Remember to Save when you're done. 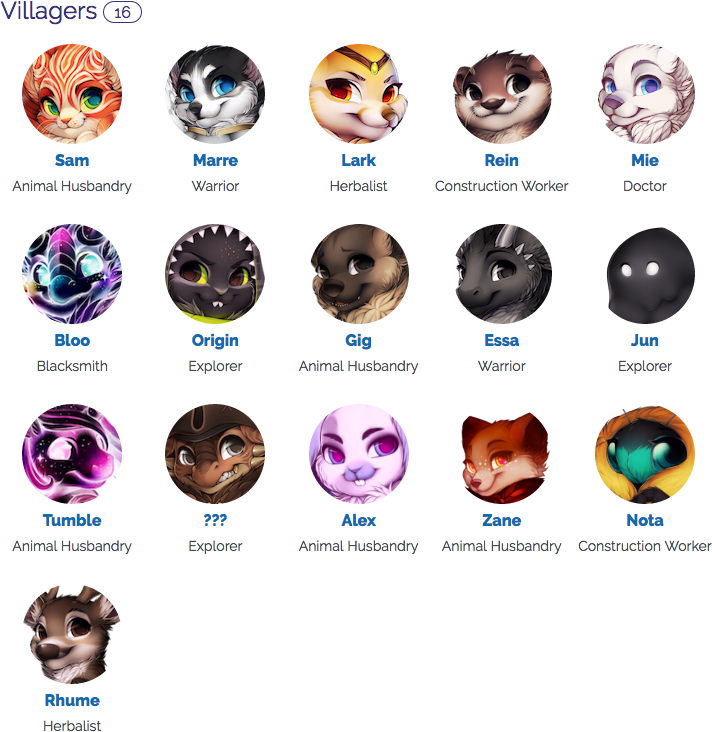 Your sidebar can show a maximum of 11 villagers if your Active Villager is not one of your first 10 displayed Villagers and View More is enabled. Villager Display order on your sidebar matches the order on your User Profile, and as such, is changed from Edit Profile. It's a simple drag and drop. Don't forget to Save. 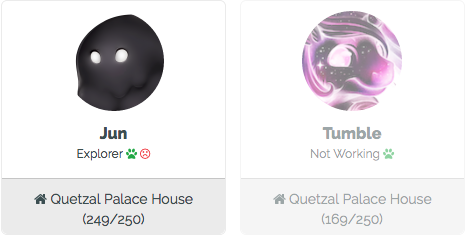 The order of the villagers' houses on your Villagers page is not tied to the order on the sidebar or Profile. The order in the example just happens not to have been changed around. Let's take a closer look at the Villagers page. FurCash Slots are the first ones that you can unlock in order to make or adopt new villagers. You get your first FurCash Slot from the moment you sign up and create your first villager. The next three slots cost 500 FC , 1000 FC , and 5000 FC respectively. After those 4 slots, every new Villager Slot requires a House from the village of your current residence. Houses can be built by your Construction Workers or found in User Stalls. Slots 5 through 10 require only the correct House to unlock. After 10 slots, there is an additional 50,000 FC fee for each slot you unlock. The fee is non-refundable, even if the house is removed or broken. If you click Remove House while no one is residing in it, the slot disappears and you have to pay the fee again to unlock it. Houses lose durability only if an active Worker is residing in it, so feel free to unlock slots ahead of time. The Villagers page gives you a quick look at which villagers are working, the status of their houses, which villagers have a pet attached , and also which are sick . Hovering over the red sad face even tells you the illness if you need a reminder. 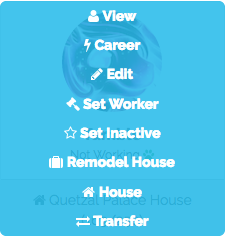 By clicking on the villager, you can also access the villager's Profile, visit their active Career page, Edit their profile, set/unset them as a Worker, make them Active/Inactive, Remodel their house, replace their House, and Transfer them to another User. From the sidebar, you have quick access to two things. 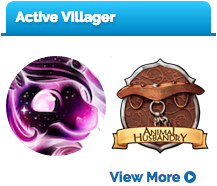 The villager icon takes you to the Profile, and the career badge to the Career page. At the top of your villager's Profile, you can view its Wardrobe, Set as Active (if it isn't already), and Upload a Paintie. Painties are one way to customize your villager. Review the rules before you set out to make one. The Wardrobe allows you to save several Painties on one Villager and switch between them at will. Next to the villager, a pet appears if one is attached with the options to rename, detach, and play (once an hour). Villager Info gives details about your villager including its Name and Gender which can be changed from (Edit). 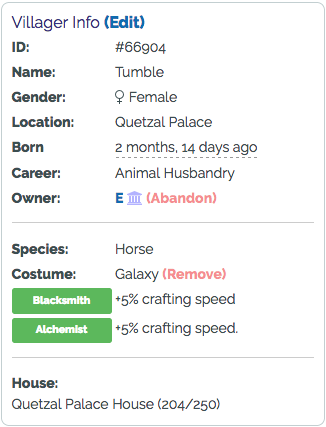 The Edit link here gives the same profile editing window as from Edit on the Villagers page. You can give the villager a Description and add CSS customization by editing the profile as well. Hovering over the time next to Born shows you the actual date and time the villager was created. If you want to Abandon your villager, the option is next to your username as the owner. Wandering Villagers can be picked up by anyone from their Town Hall. You can abandon at most one villager per day. Details of its Species and Costume let you know what base the Paintie should match. Costumed villagers do not need to match its Costume and Species, but are the only villagers permitted to use its particular Costume's bases. Otherwise, Villagers can use any bases within its Species group as long as it is not a limited holiday base or Costume base. Lastly, you can see the durability left on the House or a message that the House is destroyed! A house loses one durability point each day a Worker lives in it. At 0 durability, the house is destroyed and the villager cannot work. 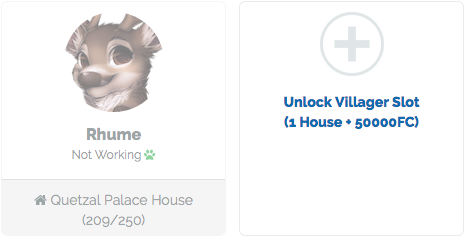 You can Replace House at any time before 0 from the Villagers page. Remember the house has to match your current village! You can also Repair the house with a Construction Worker set as your active, or from the Maintenance Market without Removing it first. 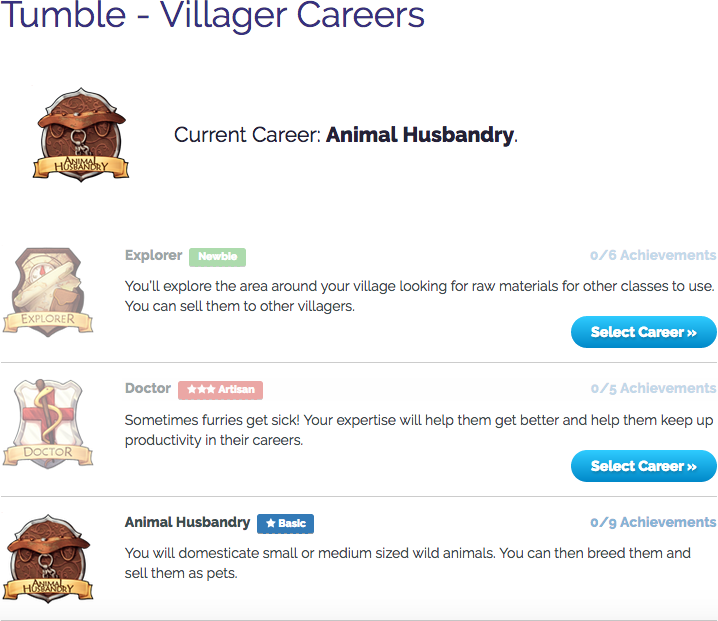 The Career box lets you access the villager's career page, just like the badge in the sidebar does. 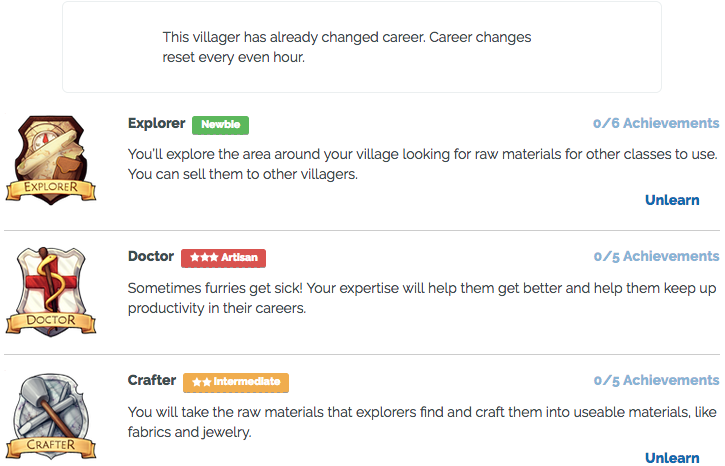 You can also View All the careers that your villager has had. If your villager is ill, information follows below this section. If your villager's house is broken, it acts as a "major illness" and prevents your villager from working. This is the same page that you can access from the Change Career button on the active Career page. A villager can remember up to 4 careers and can switch careers at most once every even hour. If you cannot change, the button is grey on the active Career page, and there is no option to Select Career anyway if you access the page from View All on the profile. 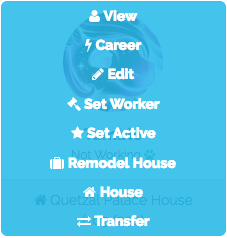 You can view your Villager's active Career page at any time, but you can only perform actions on Workers. Your account can have a maximum of 10 active Workers at a time unless you have a Worker Slot Totem from placing First-Tenth in the monthly Feast or your village has won the monthly Food Drive. The Totem will grant your account a permanent worker slot. Everyone from the highest scoring village for the Food Drive wins a temporary extra worker slot for the next month. If the villager has a Paintie applied, an additional box shows up with a Block button, details about its time of Approval, Likes, and Tags used. 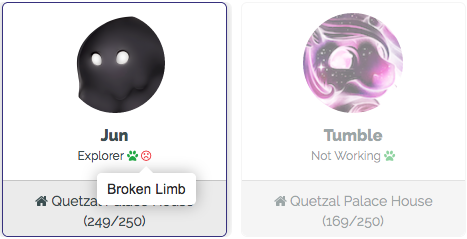 Blocked Painties appear as the base species and color to the user who blocked them. The Profile Description you typed in the Edit window shows up in the About section. Each villager also has its own Comments section which can be turned off in User Settings. The comments on a villager page are posted as being from a user's active villager. At the bottom of every Profile, you can Report problems to the Moderators.